Grandma’s Old Fashioned Carrot Cake is a deliciously classic recipe full of carrots, cinnamon, pecans, and raisins. It is sweetened with a little crushed pineapple, which also keeps the cake moist and tender. The Cream Cheese Buttercream is my favorite. With only FOUR INGREDIENTS it is easy to whip up and is super delicious. It has the perfect balance of sweetness from the powdered sugar and tartness from the cream cheese. However, the sweetness is balanced and the tartness is calmed by adding a stick of butter. There are few things more precious in this world than recipes that are handed down from Mothers and Grandmothers. It is so much more than a recipe. It holds the ties to memories of family gatherings and holidays, of conversations and laughter from the kitchen to the table. Not to mention the flavors and smells that can flood your mind with sweet memories of your family and childhood. They are a treasure to behold! Aren’t Grandma recipes the best?? They are uncomplicated and simply delicious. I love that they only include ingredients that are easy to find… because no one was using jackfruit or sorghum flour back in 1945. You can always trust that Grandma recipes are tried and true! If you choose to make this cake in a 9×13 pan, one recipe of the Cream Cheese Buttercream will be plenty. However, if you choose to make the cake in (3) 8 inch round pans I would recommend doubling the buttercream recipe. I find when I frost a layer cake it always takes a TON of frosting to get the job done. Whether you make your cake one layer or three, I would definitely recommend frosting with 1/3 to 1/2 of the frosting first, in a “crumb layer”. That is professional baker speak for messy layer (BTW I am not a “professional baker”, just so we are all on the same page). That way if some crumbs roll up into that first layer of frosting you are not left with a hot mess. You can then go back with the remaining frosting and cover up the crumb layer. This is the pretty layer. Dear ol’ Martha Stewart taught me this next tip. If you are frosting a layer cake put a few pieces of parchment or wax paper under the edges of the bottom layer, covering out to the edges of the cake plate. That way when you are done frosting you can pull the paper from under the edges and you are left with a clean and beautiful cake plate. Did you make this recipe and loved it so much you can’t keep it to yourself!? Let me know! Drop me a line or comment on the recipe! If you share a picture on social media tag me @momsdinnerinsta on Instagram or @momsdinner on Facebook. I’ll love ♥ you forever. I hope you will give this recipe for Grandma’s Carrot Cake with Cream Cheese Buttercream a try in your kitchen! 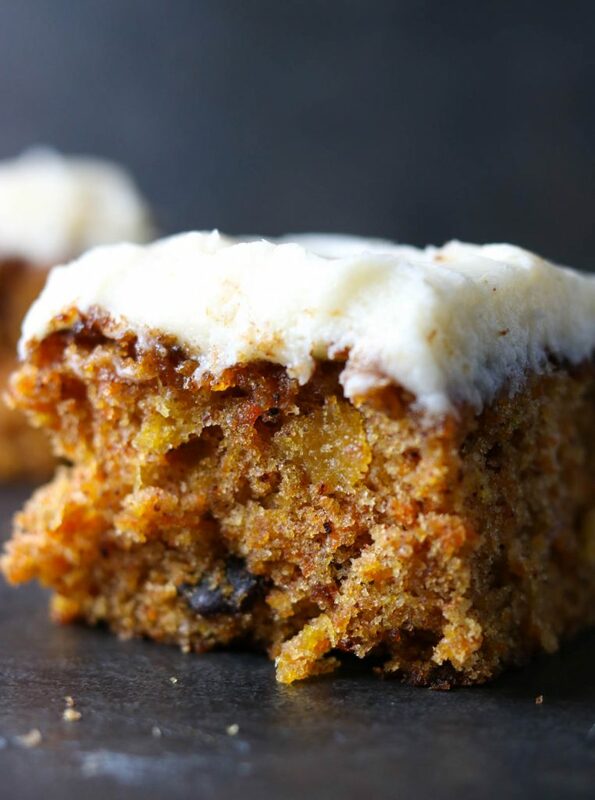 An Old Fashioned Carrot Cake recipe that is tried and true from my Grandma's recipe box. It is super moist carrot cake made from scratch. A little pineapple is added to keep the cake moist and sweet. The icing is a perfectly flavored 4 ingredient Cream Cheese Buttercream. 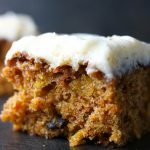 This is the Carrot Cake recipe you will add to your recipe box! Preheat the oven to 350 and prepare your pans with baking spray. You can make this in a 9x13 pan or (3) 8 inch round pans. In a large bowl sift together the flour, baking powder, baking soda, salt, cinnamon, and allspice. Set aside. 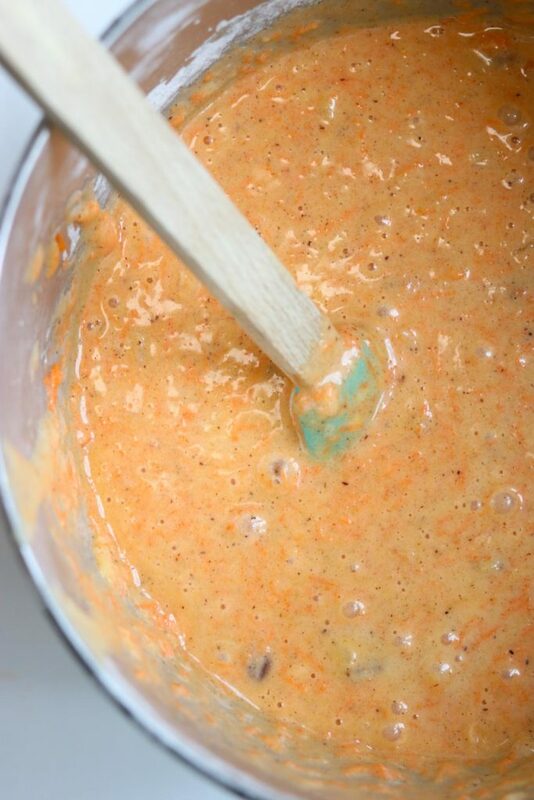 Using a hand mixer or a stand mixer with the paddle attachment, cream together the sugar, oil, and eggs. Add the flour mixture into the egg mixture, a little at a time, until it is well combined. By hand, stir in the carrots, drained pineapple, raisins, nuts, and coconut (if using) until it is evenly distributed. Pour the batter into your prepared baking pan(s), and bake for 30-35 minutes, until the cake is cooked thru. If you use 8 inch round pans, once they come out of the oven wait 5-10 minutes before trying to remove the cake from the pan. The cakes should be completely cool to the touch before frosting. Using a stand mixer with a paddle attachment or a hand mixer, blend together the butter, cream cheese, powdered sugar, and vanilla until it is completely blended and smooth. If you make the cake in the (3) 8 inch pans, plan on DOUBLING the Cream Cheese Buttercream recipe to make sure you have enough to cover all layers. I don’t eat desert often, but when I do, carrot cake is one of my favourites. You recipe sounds delicious! And I love that it has been handed down by your grandmother – so special. I am looking forward to making it for my family. 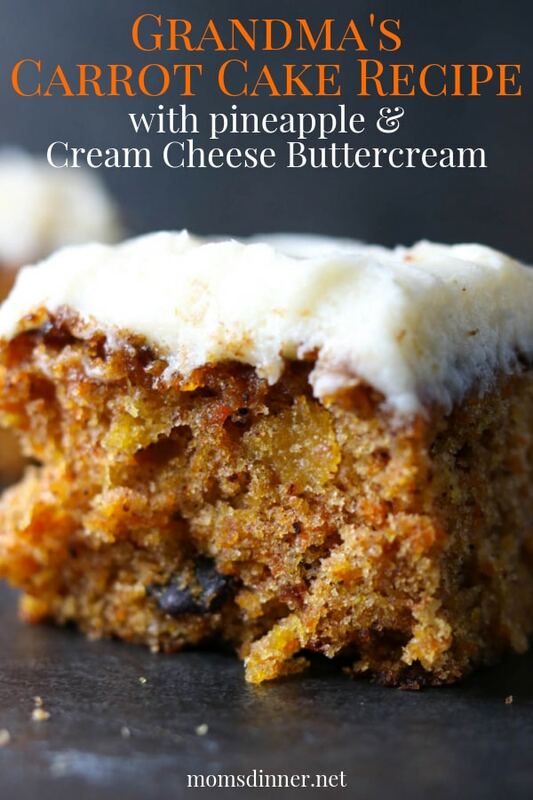 I love carrot cake too, especially this recipe. You will love the buttercream too- it is perfection! Thanks for checking it out. I adore carrot cake. I do love recipes that are handed down through the generations!! Especially grandmothers recipes, for some reason they are very precious! Your carrot cake looks so delicious and I look forward to making it! Heirloom recipes are precious. They are a tie to our history and I love that !! I have a lot of great memories in my Grandmas kitchen and around her dinner table. This does remind me of one my grandma used to make! I’m not much of a baker but I love making an over the top cake like this for Easter. It looks so moist and that frosting!! I am definitely not a “professional baker” either. But, it is easy when you have a great recipe to follow! They are the best! This is an Easter staple. 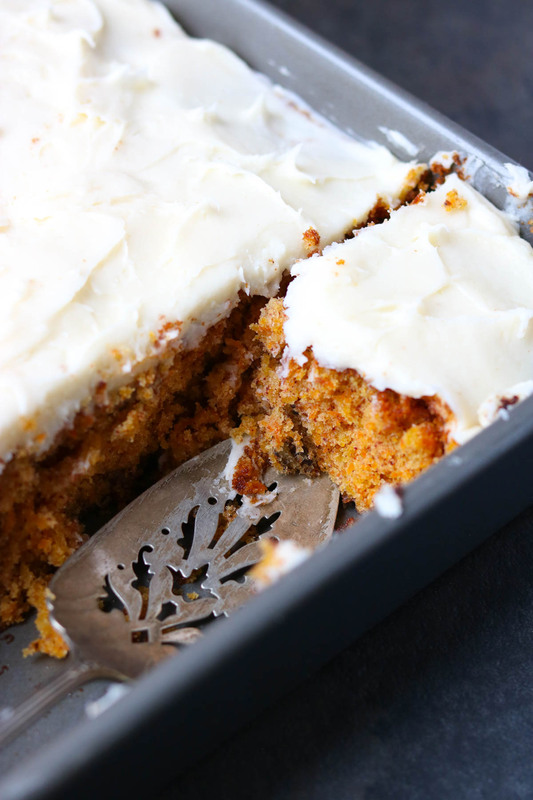 This carrot cake just screams Eat me! 🙂 Love the addition of pineapple to make it extra moist! Thank you, Julia! I love the pineapple in this recipe. It adds the perfect extra sweetness and a little bonus texture.